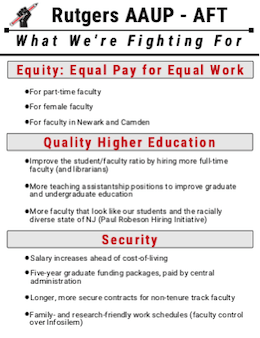 Rutgers University president Robert L. Barchi on Wednesday pledged $20 million in additional funding for the systemwide Faculty Diversity Hiring Initiative. The current $22 million initiative to hire, mentor and retain professors from diverse and underrepresented backgrounds was set to expire in 2021 but will now continue through 2024. Soili Smith has limited choices: She can work a $12-an-hour job and fail to pay her bills, risking eviction. Or she can take a higher-paying summer position that requires her to miss the last few weeks of classes and fly thousands of miles to northern British Columbia, where she’ll work 14-hour days in the bush. 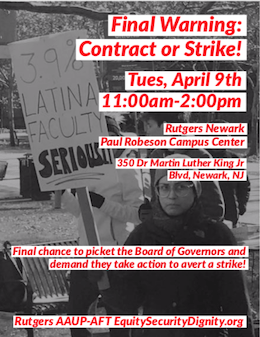 Rutgers unions are asking for support for fair contracts at Newark Tuesday, April 9 on the Newark Campus. Stop through to rally outside the Board of Governors meeting or attend the meeting and hear for yourself.